Yes, I’ve written about this subject once before, Everything You Need to Know about Wind Energy Was Written in 1957!, but I am moving the date back thirty years in the light of more research. The more I learn about wind energy, the more I realize how little I know. This realization began when someone--who wishes to remain anonymous--threw Albert Betz’s treatise on wind turbines over my electronic transom in 2016. The well worn first page was adorned with official looking stamps and initials of various people approving the circulation of the document that was ominously addressed to the Dept. of National Defence. If you’re a student of the English language the spelling should tip you off that it wasn’t a Yankee who sent the document to me. It wasn’t a secret. I was able to find publicly available versions after a little online digging. For whatever reason, the document came to me shrouded in mystery. But it was significant. After only a glance I realized that this was the foundational document of modern wind energy. Technical Memorandum 474 by the National Advisory Committee for Aeronautics--better known as NACA--was titled simply “Windmills in the Light of Modern Research” by one A. Betz. It was an English translation of a paper written by Betz, a naval engineer working in the aeronautical laboratory at the University of Göttingen. The translation was dated August 1928. The source document, “Windmühlen in Lichte neuerer Forschung,” was published in Vol XV, No. 46 of Die Naturwissenschaften in November 1927. Anyone working in wind energy knows A. Betz--or should. It was this and his previous treatises on the subject where he concluded that the maximum energy a conventional wind turbine could capture was 16/27 or 59.3% of the energy in the wind. He is the Betz of the Betz Limit. It’s just as well that I came across the English translation. The original German document is still behind a $40 paywall at Springer Verlag after nearly 90 years! In my previous article I wrote that everything you need to know about wind energy was written in 1957 based on the work of French wind energy pioneer Louis Vadot. In the research for my new book, Wind Energy for the Rest of Us, I concluded that our technical understanding of wind energy and wind turbines was well known by the mid-1920s in part based on the work of Betz and Ludwig Prandtl, his boss at Göttingen. However, I hedged my bets, noting that wind technology was certainly well known by the mid-1950s. After reading passages in Betz’s legendary discourse it is clear now that we knew what we needed to know about wind turbines and wind energy by 1927 in German and by 1928 in the English-speaking world. Below are some topics from his paper that throw light on why modern wind turbines look the way they do and why they are designed the way the are. Thus, claims of exceptionally high conversion efficiencies of one design over another are important only when all else is the same, including the cost of the turbine and its reliability. For example, claims of greater efficiency of new ducted turbines are noteworthy if the capital costs and reliability are the same or better than those of the conventional wind turbines with which they compete. As I’ve been saying for decades now, it means nothing if you have the most efficient wind turbine ever built if the turbine doesn’t operate reliably. Wind turbines are, after all, power plants. They must operate day-in, day-out, year around. We sell kilowatt-hours and it’s that hour in kilowatt-hours that is just as critical as kilowatts of power. In other words, a wind turbine that stands idle in the wind is useless no matter how big its generator is in kW or how efficient it might be if it were operating. Betz goes on describe the fundamental metric on which to judge one wind turbine against another. Our wind turbines generate electricity in kWh. That is what we sell. We don’t sell capacity in kW. Of course charlatans have infamously taken advantage of this confusion. I’ve written about these hustlers many times in the past and again in my new book Wind Energy for the Rest of Us. These mountebanks trap the unwary with grand claims that their wind turbines offer the lowest cost in $/kW of any other wind turbine. As I’ve noted many times before, you can have a very inexpensive wind turbine in terms of $/kW of installed capacity but generate very expensive electricity if the wind turbine doesn’t operate reliably--for whatever reason. Betz explained this succinctly in 1927! The key phrase here is “of no particular use.” That is, why bother? There’s so little energy in low wind speeds there’s no practical point in trying to use it. In other words, there’s an engineering tradeoff here and since there’s more energy in the wind at higher speeds, we willingly sacrifice what little is available as Betz says, “in very weak winds” for the greater generation from stronger winds. So if you see a claim that an Internet wonder operates at wind speeds of say 2 mph you’ll know that they’ve never read Betz and, worse, probably have never heard of him. Betz begins his famous mathematical derivation with the simplest of wind turbines: a drag device using a simple flat plate. He summarizes his results thus. Thus, the rotor of a drag device can only capture 33% of the energy in the wind, according to Betz. Even so, he suggests this might be acceptable if you could do it cheaply enough, reflecting his earlier statement on the role of efficiency in determining cost-effective wind generation. However, with his warning that the efficiency of a drag device might be too low, Betz sets up his second example that of a wind turbine where the blade moves transverse or perpendicular to the wind, that is, a conventional wind turbine spinning about an horizontal axis. He then introduces a number of concepts that ultimately lead to his calculation of the maximum efficiency of an unducted rotor. Keep in mind that Betz was writing at a time when there were great advances in the science of what we now call aerodynamics, following the Great War. Importantly, he describes the lift and drag forces acting on a blade as it moves across the wind and how these change relative to the speed of the blade through the air. The latter, the ratio of the speed of the blade through the air relative to the speed of the wind across the ground, is known as the tip-speed ratio. This is the reason wind turbines use wings or airfoils rather than flat plates, cups, buckets, or similar “wind catchers.” Wind turbine blades literally fly through the air. That’s how they work and why they are so much more efficient than drag devices. Betz then examines the design of the windmill or rotor itself. He explains as a rotor blade moves through the air it affects the air around it. This then has an effect on any blades following it through the air. This is true, he says in a footnote, even if the rotor only has one blade. Even in the 1920s, engineers, such as Betz, knew that you only needed one blade to make a wind turbine function. In short, this explains why modern wind turbines use two or three slender blades rather than filling the rotor disc with many thick blades. This isn’t intuitive. Consequently, many untutored inventors try to cram the rotor disc with as many blades as physically possible as this seems to make sense intuitively. Betz calls the solidity of the rotor, that is, how much area of the rotor disc is covered by the blades, the vane density. Modern, high-speed wind turbines have low solidity—or Betz’s vane density—relative to a high-solidity, slow-speed wind turbine such as a farm windmill used for pumping water. As Betz says, “The faster a windmill is designed to rotate, the smaller must be its vane density.” As the tip of the blade moves faster through the air than that portion of the blade near the hub, it must be more slender so the rotor has less vane density or solidity at the tip than near the hub. This explains why today’s wind turbine blades taper from the hub to the tip. Thus, says Betz, it’s best to design a wind turbine “with a high rotational speed for two reasons. In the first place, a smaller vane area is required and the windmill is correspondingly simpler.” The second reason is that a high-speed turbine requires a smaller gearbox to step up the shaft speed to that required by a generator relative to that of a low-speed turbine. Remarkably, Betz is prescient about the need for standardized testing of wind turbines. He could have been writing about the introduction of new wind turbines in 2017 and not 1927. He notes that, “Since the manufacturers have an interest in making their windmills appear as efficient as possible, they naturally use the best of the various test results in their advertising, and it thus happens that much too high performances are announced in very many catalogs.”Of course in Betz’s day they used catalogs to search for products and not Google. His lament, unfortunately, could be applied to the dozens of Internet miracles that are circulated endlessly on social media as various wind panaceas “not like those other windmills”—the ones that work. Betz then singles out for mention one of the world’s first wind turbine test sites, where “Relatively good results have recently been obtained in the Agricultural Institute of Oxford University.” His citation notes that Oxford published the results of their testing in 1926. 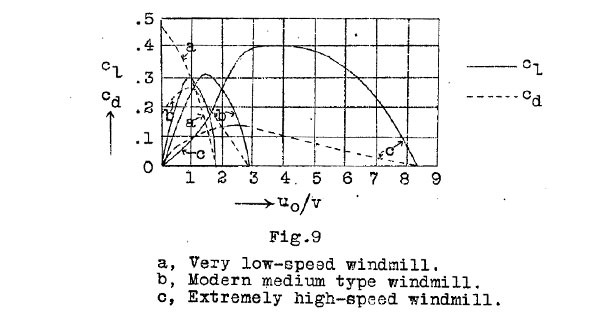 More than 80-years after Betz’s paper--and after Oxford published the results from their test field--the American Wind Energy Association instituted standardized testing of small wind turbines. The trade group debated whether they should do so for nearly three decades. While Betz’s paper is most widely known for his conclusion that the best a conventional wind turbine can hope to do is capture 16/27 of the energy in the wind, his discourse is chocked full of the elemental design characteristics of modern wind turbines. So much time, money, and talent have been squandered over the decades through ignorance of this early work in wind energy. We in the wind industry ignore Betz’s wisdom from 1927 at our peril.